Colleagues of the Max Planck team are delighted so much progress has been made in defining the Neanderthal genome, so soon after the announcement, a few years ago, of the complete human genome but key figures in the fields of evolutionary biology and paleoanthropology question whether the complex statistical analysis outlined in the paper in fact supports the hypothesis there was interbreeding between the two species. The authors’ genetic analysis also challenges the “out of Africa” hypothesis which posits we modern humans, Homo sapiens, throughout the world trace our ancestry to anatomically modern humans who migrated out of Africa around 50,000 years ago. Science has published a special section, available without the usual subscription requirement. Also the New York Times has an informative account of the Science announcement. 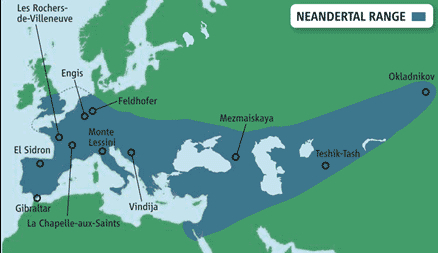 The Neanderthals (Homo neanderthalensis) ranged from Spain to southern Siberia and as far south as modern day Israel and Palestine, according to this map, and lived from about 130,000 years ago until their extinction 28,000 years ago.